Unfortunatly we are out of stock and unable to obtain more We will keep trying! These perfectly handcrafted knives by Joel Bukiewicz are brand new to our store. Right now we have 3 from his first production and will be adding more ! a culinary treasure to any chef. 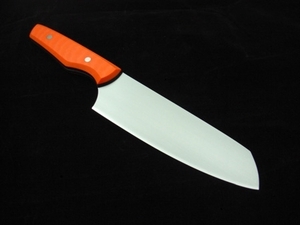 Called the porche of knives by one of our top clients - this name is well deserved. --Electrical Properties—Excellent for high technology communications and computer systems. --Mechanical Properties—Greater than paper base and composite materials. --Moisture Absorption—Lower than paper base and composite laminates. --Glass Transition Temperature—Higher than most FR-4 laminates. --Solder Float—Passes 160 seconds at 575°F. The stuff is pound-for-pound stronger than steel and simply put will not break; dropped, slammed, kicked, run over by a truck; that stuff will keep on ticking. And it won’t absorb juices of any kind on your cutting board. For my purposes, it’s also very workable (meaning I can get those sharp and good-looking angles on it) and it also comes in an excellent variety of colors. The pins in the chef’s knives are made of steel and copper and black epoxy. And the pins in the Santoku are Titanium. The steel I use is called CPM154. It’s American made, by Crucible Materials, a company based in Syracuse. It’s brand new, only about a year old but is proving to be one of the finest stainless steels ever used in the knife world. As said, it has a super fine grain structure and a high carbon content; perhaps that’s all your customers need to know. CPM stands for “Crucible Particle Metallurgy”, which refers to the special process by which the steel is made; also sometimes called a “powder steel”.